I do not know Bill Gurley personally, but I do know of him, and I was surprised, sitting in Vienna airport waiting for a connection home on Friday morning, to get an email from him. In the email, he graciously gave me a heads-up that he was planning to post a counter to my Uber valuation and that it would not pull punches. A little while later, I started getting messages from those who had read the post, with some seeking my response and some seeming to view this as the first volley in some valuation battle. I read the post a few minutes later and the first person I wrote to after I read it was Bill Gurley and I told him that I absolutely loved his post, even though it was at complete odds with my assessment of the company, for two reasons. Like anyone else, I like being right, but I am far more interested in understanding Uber's valuation, and the post provided the vantage point of someone who not only is invested in the company but knows far more about it than I do. Rather than berating me for not getting "it" (technology, the new economy, progress) or abusing valuation as a tool from the middle ages, the post focused on specifics about Uber and the basis for its high value. In this earlier post of mine, I argued that good investing/valuation is the bridge between numbers and narrative and that neither the numbers nor the narrative people have an automatic right to the high ground. Bill Gurley's post brought home that message by laying out a detailed and well-thought-through narrative, backed up by numbers. Mr. Gurley's narrative lends itself well to a more grounded discussion of Uber as a company and I am grateful to him for providing it. As a teacher, I am constantly on the lookout for "teachable moments", even if they come at my expense, and I plan to use his post in my classes. You can download the valuations by clicking here. 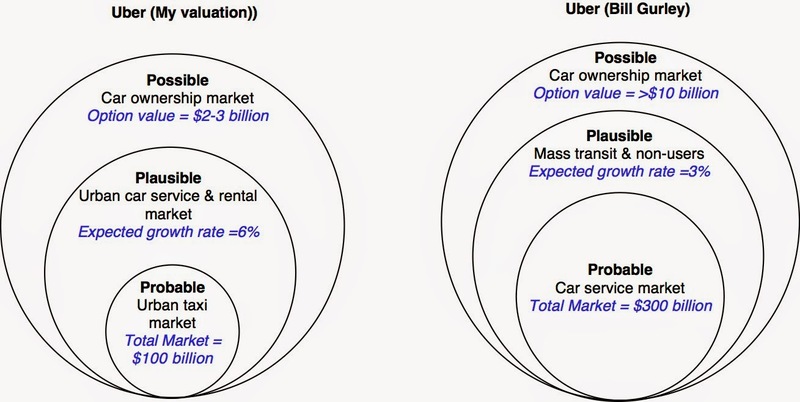 (Uber (Gurley) and Uber (Damodaran)). Given that the values delivered by the narratives are so different, the question, if you are an investor, boils down to which one has a higher probability of being closer to reality. If you had to pick one right now, I think Mr. Gurley's has the advantage over mine for at least three reasons. The first is that as a board member and insider, he knows far more about Uber's workings than I do. Not only are his starting numbers (on revenues, operating income and other details) far more precise than mine but he has access to how Uber is performing in its test markets (with the new users that he lists). The second is that as an investor in Uber, he has skin in the game, and more at stake than I do and should therefore be given more credence. The third is that he not only has experience investing in young companies, but has been right on many of his investments. Does that mean that I am abandoning my narrative and the valuation that goes with it? No, or at least not yet, and there are three reasons why. First, it is difficult, if not impossible, for someone on the inside not to believe the best about the company that he directs, the managers he listens to and the products that it offers. Second, an investor in a company, especially one without an easy exit route (at least at the moment), is more attached to his or her narrative than someone who has little to lose (other than pride) from abandoning or altering narratives. Third, as Kahnemann notes in his book on investor psychology, experience is not a very good teacher in investing and markets. As human beings, we often extract the wrong lessons from past successes, don't learn enough from our failures and sometimes delude ourselves into remembering things that never happened. I am not suggesting that Bill Gurley is guilty of any of these sins, but I am, by nature, a cautious convert and I will wait to buy into his narrative, compelling though it may be. As I noted at the start of this post, I liked Bill Gurley's post because it offers a coherent narrative that leads to a higher value. The narrative has two key building blocks and I think that there is much to be gained by taking a closer look at them. The first is that Uber is pursuing a much larger market than just taxi service and that it may very well redefine the nature of car ownership. The second is that Uber will have networking effects that will allow it to capture a dominant market share of this larger market, well above the 10% that I estimated in my original value. In the sections below, I hope to stress test these assumptions, more as a friendly observer than antagonist. Reason to switch: Uber has to provide users with good reasons to switch from their existing services to Uber. For taxi services, the benefits from using Uber are documented well in the Gurley narrative. Uber is more convenient (an app click away), more dependable, often safer (because of the payment system) and sometimes cheaper than taxi service. However, the trade off gets murkier as you look past taxi services. Since mass transit will continue to be cheaper than Uber, it is comfort and convenience that will be the reasons for switching. With car rentals, Uber may be cheaper and more convenient in some senses (you don't have to worry about picking up a rental car, parking it or worrying about it breaking down) and less convenient in others (especially if you have multiple short trips to make). With suburban car service (the aged parents, the dating couple and school bound kids), the problem that Uber may face is that a car is usually more than just a transportation device. Any parent who has driven his or her kids to school will attest that in addition to being a driver, he or she has to play the roles of personal assistant, private investigator, therapist and mind reader. As for date nights, whether Uber succeeds will be largely a function of how much the car itself is an integral part of the date, especially with younger couples. Overcome inertia: Even when a new way of doing things offers significant benefits, it is difficult to overcome the unwillingness of human beings to change the way they act, with that inertia increasing with how set they are in their ways. It should come as little surprise that Uber has been most successful with young people, not yet set in their ways, and that it has been slower to make inroads with older users. That inertia will be an even stronger force to overcome, as you move beyond the car service market. The articles that point to young people owning fewer cars are indicative of larger changes in society, but I am not sure that they can be taken as an indication of a sea change in car ownership behavior. After all, there have been almost as many articles on how many young people are moving back in with their parents, and both phenomena may be the results of a more difficult economic environment for young people, who come out of college with massive student loans and few job prospects. Fight off the status quo: The empire, hobbled and inefficient though it may be, will fight back, since there are significant economic interests at stake. As both Uber and Lyft have discovered, taxi service providers can use regulations and other restrictions to impede the new entrants into their businesses. Those fights will get more intense as car rental and car ownership businesses get targeted. Here again, Bill Gurley has two advantages to work with. The first is that as an investor and insider, he has access to information on Uber's experiences and experiments in its frontier markets (mass transit and suburban users), that may have led him to shift these markets from the plausible to the probable. The second is that as a board director and advisor to management, he is in a position to influence Uber's potential in these markets. For all we know, the Uber Momcar and the Uber Datecar have been already conceived, market tested and are ready to go. I think Bill Gurley and I agree on the car ownership market more than we disagree. I see it as a possibility right now and attach an option value of about $2-3 billion to it, partly because it is in the more distant future and partly because Uber's business model in this market is unformed. From Bill Gurley's description of the market, I think he sees it as a possibility as well, though I think he attaches a larger value to it than I do. The reason for the higher value is that it is a conditional possibility, with the likelihood of it happening increasing with the success that Uber has in the car service market. The second part of the Gurley Uber narrative rests on the company having network benefits that allow it to capture a dominant market share. As Mr. Gurley notes, a networking effect shows up any time you, as a user of a product or service, benefit from other people using the same product and service. If the networking effect is strong enough, it can lead to a dominant market share for the company that creates it and potentially to a ‘winner take all’ scenario. The arguments presented in his post for the networking effects, i.e., pick up times, coverage density and utilization, all seem to me to be point more to a local networking effect rather than a global networking one. In other words, I can see why the largest car service provider in New York may be able to leverage these advantages to get a dominant market share in New York, but these advantages will not be of much use in Miami. There are global networking advantages listed, such as stored data that can be accessed by users in a new city and partnerships with credit car, smartphone and car companies, but they seem much weaker. In fact, if the local networking advantages dominate, this market could very quickly devolve into a city-by-city trench warfare among the different players, with different winners in different markets. Thus, it is possible that Uber becomes the dominant car service company in San Francisco, Lyft in Chicago and a yet-to-be-created company has the largest market share in London. For the Gurley Uber narrative to hold, the global networking advantages have to become front and center and here again, it is possible that I am unaware of a management initiative designed to do exactly this. I know that this may be hard to believe but I have less of an interest in making the case that Uber is over priced than I am in understanding what it is that drives its value. I have learned a great deal about why Bill Gurley is so excited about the company but I am inherently cautious, not because I don’t find his arguments to be plausible, but because I have seen how often the plausible does not make the transition to the probable and how frequently the probable fails to show up in the actuals. That quality may make me a bad venture capitalist but I am sure that there are plenty of good ones out there to take up the slack. You say that, "a networking effect shows up any time you, as a user of a product or service, benefit from other people using the same product and service." And yet I believe you fail to mention Uber's driving (no pun intended) networking effect: their robust referral program. In your last post you mentioned you are not an Uber user, so it may be that you are unaware of this incentive. Uber gives users 'free rides' for each friend they are able to refer to the app. These rides range anywhere from $10 to $30 depending on the current promo (a large spend category of their funding as drivers are still compensated so cost to Uber is $8 to $24), this currently stands at $30 for each friend referred. To me this is the ultimate driver of global virality, because as an Uber user in New York I can (and, in fact, am handsomely rewarded for) referring my friends around the globe of the app and it's benefits. It is for this reason that I am inclined to say that your proposed market share of 10% is on the low side. That being said, Gurley's estimate of 40% is astronomical and undoubtedly reflects the opinion of an optimistic investor rather than a level headed outsider. My estimate would lie somewhere in between the two figures, likely somewhere around 25% in 10 years time. Priceline seems like a good comp to Uber...priceline is a middle man, matching asset owners (hotels) with users (vacay/business travelers). So priceline's value proposition is similar...hospitality is ~$1tr market. Priceline has $64bn mkt cap. On the other hand, opentable is also a middleman, matching asset owners (restaurants) with users (diners). Dining out is maybe $500bn?. Priceline bought Opentable for $2.6bn. Uber's addressable market - even in the optimistic/insider case, is a fraction of priceline, and still less than opentable's. As for margins, I can't imagine the waste (underutilization) embedded in taxi margins are anywhere near the waste inherent to restaurants and hotel margins. I'm goin with AD's estimate for the win. This has been the case in the low-hanging fruit markets, but is already under pressure in the case of UberX and will be increasingly so due to competition as the amount of money into the sector increases and the built-in phone APIs for always on geolocation expand into new versions of Android, iOS etc. This also holds for expansion into additional verticals, particularly logistics and so on. "The bottom line is that this (Uber) is a low margin business — much more akin to Amazon than Google." I think Amazon shows that capital markets are paying for "category killers", but when I think of the world 5-10 years out, I see horrendous competition in the Uber area, with the likely winner being the one who gets largest frictionless penetration onto homescreens and/or some sort of real-life identity linkage that people actually care about (so they don't abuse the platform), something I'm working on now with my company. I think growth will continue to be good and the investors in the latest round will make a good return into IPO, but I think your take is nearer for a longer-term "value" calculation. A referral program is a nice marketing device but I don't think it can be a key driver of a global networking effect. It can also cut into Uber's revenue slice very quickly, a point also made by Emad. In my first post on Uber, I argued that the revenue slice assumption has a bigger effect on value than the market share. Excellent. Easily the most gracious and reasoned response in an online valuation debate I have ever seen. The speed with which Uber can create local network effects in different geographies will be key. With every startup now wanting to be like uber for (insert category) there are a lot of copycats trying to be like uber for (insert local transport market). I would have been interested in the option valuation, which unfortunately does not seem to be included in the Excel files? Owning a car is like marrying a women and making her your wife, whereas taking rides on Uber is like having a multiple girl friends. Its always fun to have many girl friends( many car services which give the best ride at cheapest price), but one is most likely committed to ones wife. So making the car ownership a thing of past is a herculean task. Also there is factor of self-pride and social esteem associated with owning a car. Car is never just for a transport, its about your social status and a hall-mark of acheivement and i dont think that will never be changed or is difficult to change. I think the core of Uber lends itself to far greater applications than it currently serves. Uber gets things from point A to point B. As of today, those things are humans. In the future it could become a parcel delivery service for example. Imagine a partnership with Amazon where you could Uber your order to you immediately and watch it arrive to your door in real-time. Pity it's a typical Irish summers day and lashing rain! Quote "It is also easy to imagine a future where Uber drivers receive discounts on things like leases, gasoline and car repair. Scale clearly matters for these types of opportunities." Now that the author discusses about economies because there will be many Uber drivers and as a result their clout will be higher than anyone else. But, the other side of this is that if you are looking at USD 300 billion (or even more) market and many Uber drivers (how many drivers in a USD 300 billion market are we talking about!!! ), aren’t you talking about a significant shift in job markets (as the demand for Uber drivers grow exponentially as Uber grows as mentioned in articles). So the questions will be; would many people be willing to take up a job as Uber driver as opposed to other jobs that they are currently doing? If so what is the incentive for them to shift? Is it higher salaries that will shift people to become Uber Drivers? Or would it give Uber drivers the pride being a Uber driver? (because from where I come, no one wants to be a driver and takes pride in being a driver. For instance, I’m sure anyone would be happy to say that they work for Google or Amazon or Facebok, etc. But I doubt that anyone will have the same to say that they work for Uber as a driver!) if it is higher salaries that will draw more people to become Uber drivers, wouldn’t the cost structure impact the Uber’s margins? If you have good knowledge of market and investing strategy than only you can be a good investor. I agree both with Emad on questioning the assumption you both make about maintaining a 20% comission, and with others that have pointed that local players can respond city by city to Uber at least to some extent. On top of that, we can observe some kind of contradiction among platforms collecting distributed properties while maintaining centralized ownership of tha platform itself. I envision in the next few years new tipes of organizations with distributed ownership (combine bitcoin & cooperatives, swarm or ethereum) to develop low cost highly social alternatives in many of these industries. I find it interesting that you define possible and plausible as two different levels of certainty. I think most people find these two words to be completely interchangeable. However, there is one other place that has used the words possible and plausible similarly to your usage, the U.S. Supreme Court. I am interested in knowing whether your definition of possible and plausible came from the U.S. Supreme Court or from somewhere else. Where did you derive the definitions that you use? Great logic while would like to talk a bit about the valuation - have you thought of using a more bottom-up approach to crack the issue? I did not do it myself and could understand your big-pitcture story but just curious, when the risk can somewhat be modelled in the top line and it is material per se, shall we still put that in the discount factor instead? Every trader should know these markets and the networking effects and make there strategies according to it.